Feeling like you are losing your memory at midlife can be very scary, especially if you think it’s a permanent situation. Many women secretly wonder if these ‘senior moments’ are the beginning of dementia and are truly frightened, but in actuality it’s one of the most common symptoms associated with menopause. If you forget what you are saying mid-sentence or can’t remember what you went into a room for you will be pleased to know that research now shows that our brain has the ability to grown new brain cells and even increase in size all throughout our lives, improving cognitive function and memory. This is great news for those of us who have reached midlife and are starting to think that our brains are fading along with our memory. In addition to making our diet more nutrient dense and including foods that contain Mother Nature’s oestrogen, various forms of exercise, yoga and tai chi have been shown to play an important role. Why do we feel like we are losing our marbles? It’s thought most memory problems at this time of life are due to poor concentration, lack of motivation, tiredness, anxiety or stress, rather than loss of brain cells. Many surveys confirm that as we age many nutrients may be in short supply. Vitamin B deficiency, including B12 and Vitamin D, can be associated with cognitive impairment as well as depression. Vitamin E and other antioxidants may be important to help blood flow to the brain and central nervous system. One study showed for example that patients with early signs of dementia improved after being given high doses of Vitamin E.
As we grow older, our circulation slows down, thus less oxygen reaches our brain cells, so it’s no surprise we aren’t as sharp. Many of us don’t stretch our brains as much as we could. Like muscles, our brain needs to be used to function at optimum levels. The good news is forgetfulness doesn’t have to be an inevitable part of getting older. Following a nutrient-dense and phytoestrogen-rich diet, leading an active lifestyle and keeping your brain well exercised will help keep you sharp. 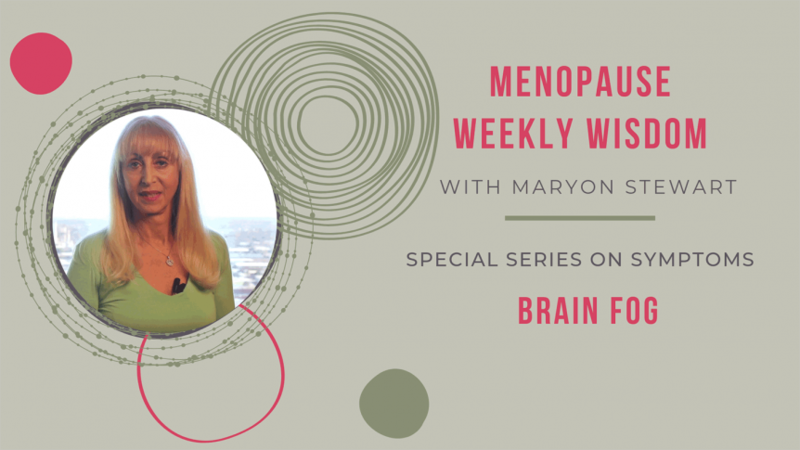 Over the course of my work with menopausal women, I have had many patients who have been misdiagnosed with potential dementia even women in their mid-thirties. This can be scary for both the person suffering and their family members. We now know that low levels of nutrients can be the culprit at the time of the menopause because our bodies go into economy mode. This can make you forgetful and unable to think straight. I like to compare it to having a bucket with a hole in it - you are never going to be able to fill it no matter how hard you try. If you go through your life with low levels of nutrients and your brain chemistry is not working normally, you are not going to be as sharp as you were before. Then add to that falling levels of oestrogen really can have a negative impact on your brain function. Thus, you cannot expect to feel normal, unless you meet your body’s needs. The first thing you need to do is get your nutrients back into optimal range. Eat a wholesome, healthy diet. Take a good strong multivitamin and minerals. I recommend Fema 45+ for those of you in the UK and Gynovite for those of you in the US. This will help put back in your body what time and nature has taken out. Consuming natural occurring oestrogens such as soy, flax seeds and the science based supplement called Promensil which contains red clover helps us fool the brain into thinking we still have more circulating oestrogen again. Remember those little receptor sites do not stay full for long, so you need to top them off little and often throughout the day. There is scientific evidence that soy isoflavones, whether in dietary or supplement form, can help with cognition and psychological symptoms around menopause. There is a high concentration of oestrogen receptors in the hippocampus - the part of the brain responsible for memory and learning - where these molecules might bind. For instance, an analysis of 10 randomised placebo-controlled clinical trials of isoflavone supplement use, covering over 1,000 women showed significant improvement in cognitive function and visual memory. It Is interesting that the impact was greatest among women under the age of 60 and, surprisingly perhaps, for shorter treatment duration. Maybe, the researchers said, there is an important 'window of opportunity' wherein supplementation and/or dietary changes should be started to gain maximum benefit for the brain and mind. Regular aerobic exercise will oxygenate your brain which helps improve your memory. For those who do not regularly exercise, start doing some things such as dancing or skipping. Make yourself do a little bit of exercise, so as you get the benefits, your body will release endorphins which make you feel much better too. I was also excited to read in a publication from Brazil that Yoga has been shown to reduce the rate at which the portion of the brain relating to memory ages. It also showed that women who practiced yoga regularly had increased levels of awareness, attention and what they called executive functions when compared to women of a similar age who didn’t practice yoga. Give yourself some mental challenges such as hand-eye coordination activities (e.g. knitting, crossword puzzle, sudoku) - anything that will keep your brain active. Another suggestion is to opt out of using the calculator and do some mental arithmetic. Remember the old adage, use it or lose it - actually applies to your brain! If you want to stay sharp, “workout your brain”. So, don’t delay! Reclaim your memory whilst you still can! If you would like to find out more about what’s going on in your body as you hit the menopause feel free to join my free Virtual Class. I will be explaining about the changes that occur and how to overcome your symptoms without resorting to drugs or hormones based on a successful programme join my virtual class tonight or Sunday by clicking here. For more about brain fog, listen to my video below.